To understand the Ford GT Carbon Series you have to understand the Ford GT Competition Series offered during the 2017 and 2018 model years. 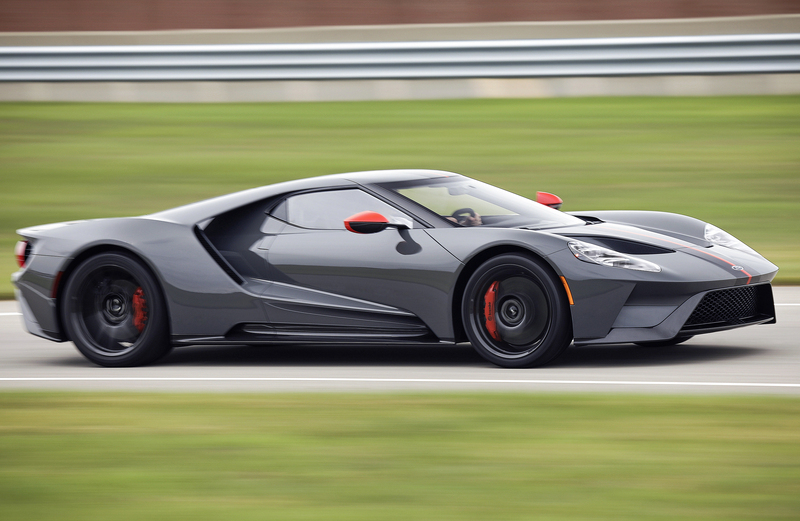 The Ford GT Competition Series was the forerunner to the Carbon Series, and the two are nearly identical in equipment. I posted a blog on the Competition Series about a month ago, when I already knew I was getting a Ford GT Carbon Series and how the two differed. Both cars offer an exposed carbon fiber stripe, though the Competition Series featured a single stripe while the Carbon Series offers dual stripes. 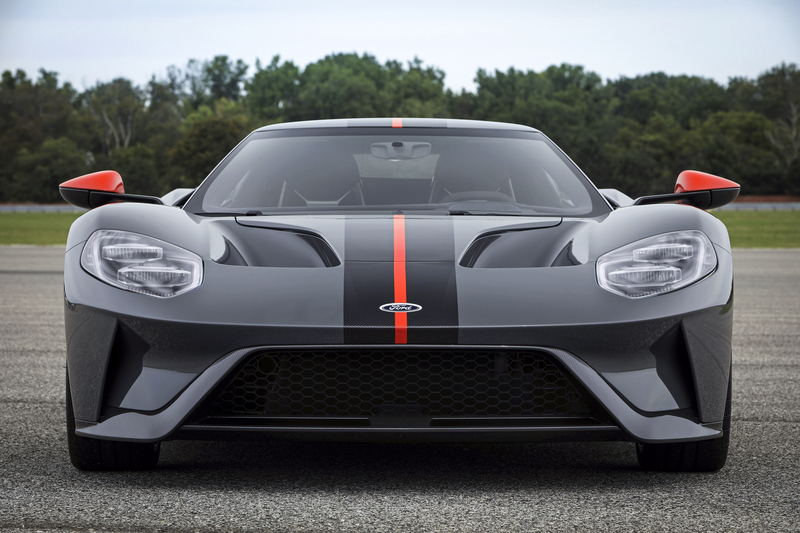 On the Carbon Series the standard exposed carbon fiber stripes are in exactly the same location as the optional painted stripes available on any new Ford GT. The Competition and Carbon Series also both come standard with exposed carbon fiber A-pillars, carbon fiber wheels, titanium lug nuts, carbon fiber lower body trim and a titanium exhaust system. All of those features, except the exposed carbon fiber A-pillars, are available on any non-heritage new Ford GT. The wheels, titanium lug nuts and titanium exhaust system save weight, but the exposed carbon fiber A-pillars and carbon fiber lower body panels are styling exercises more than weight considerations. Though, theoretically, the paint on the A-pillars and lower body trim weighs…something…versus the exposed carbon fiber. Anyway, the Ford GT Carbon Series theme continues inside, where exposed carbon fiber graces the door sills, air registers and center console. 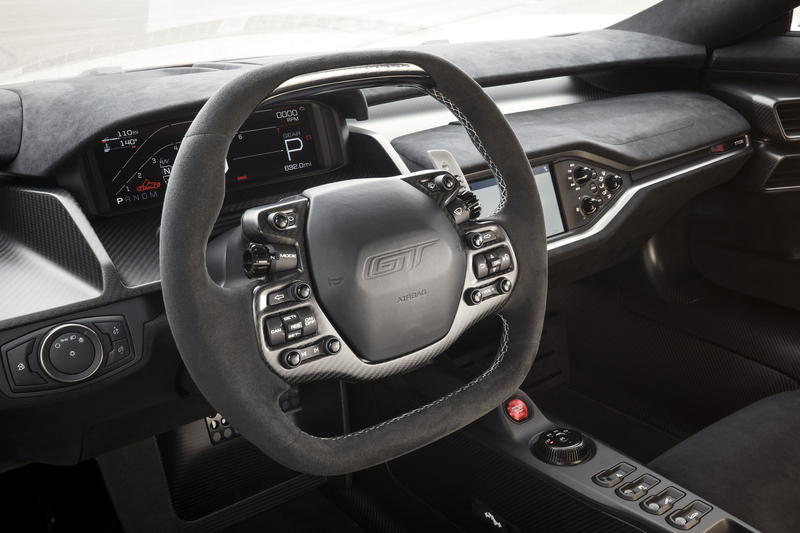 Once again, these features are available on other Ford GTs with the optional upgraded interior. But the Carbon Series does have some unique cabin cues. These include silver contrasting stitching on the seats and steering wheel, plus silver paddle shifters and a unique dash panel VIN badge. No other Ford GTs get these interior features. Even the Competition Series didn’t have the silver contrasting stitching or silver shift paddles, though it came with arguably cooler red shift paddles. But where the Ford GT Carbon Series truly breaks from the Ford GT Competition Series is on amenities. Specifically, the Competition Series saved weight by eliminating air conditioning, the audio system and the center display screen. 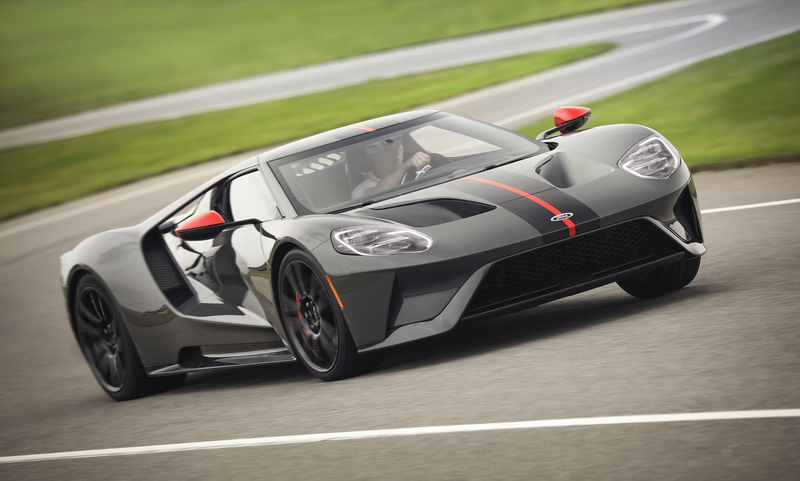 Losing those items apparently turned many buyers off, as fewer than 15 Ford GT Competition Series were built across the 2017 and 2018 model years. My understanding is that removing the climate and audio systems saved about 100 pounds. 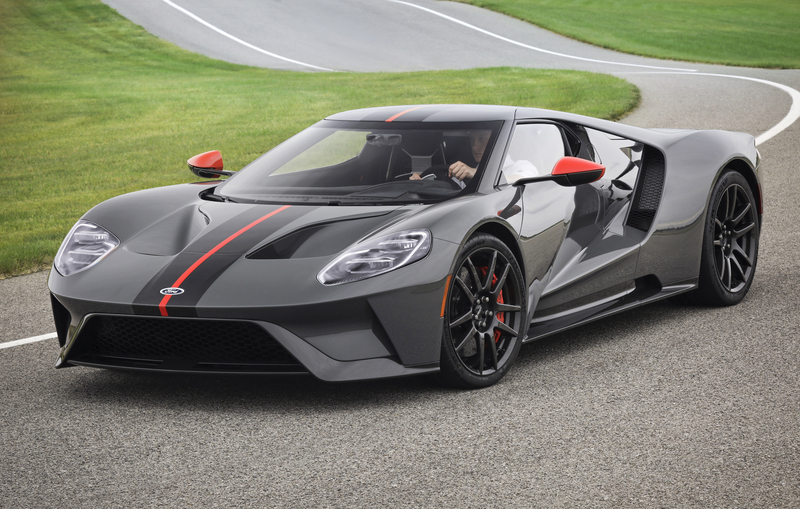 Add in the polycarbonate (instead of glass) rear hatch, plus the thinner gorilla glass between the cabin and engine compartment, and the Competition Series saved approximately 140 pounds over a standard Ford GT. 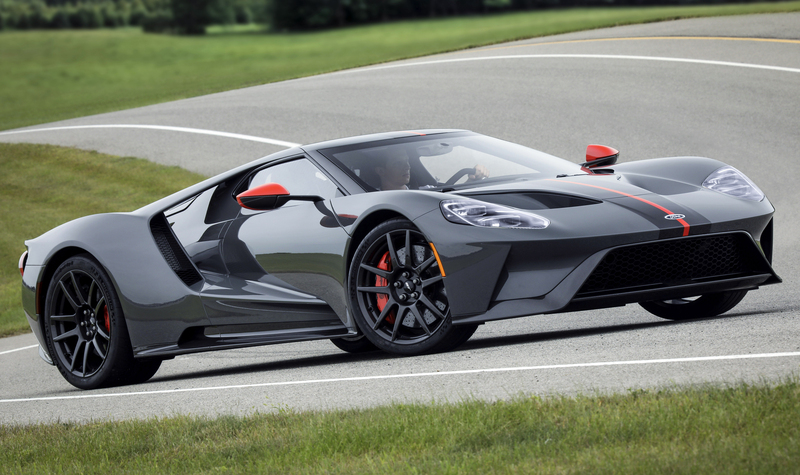 The polycarbonate rear hatch and thinner gorilla glass are part of the Ford GT Carbon Series package, but the Carbon Series retains its air conditioning, audio system and central display screen. 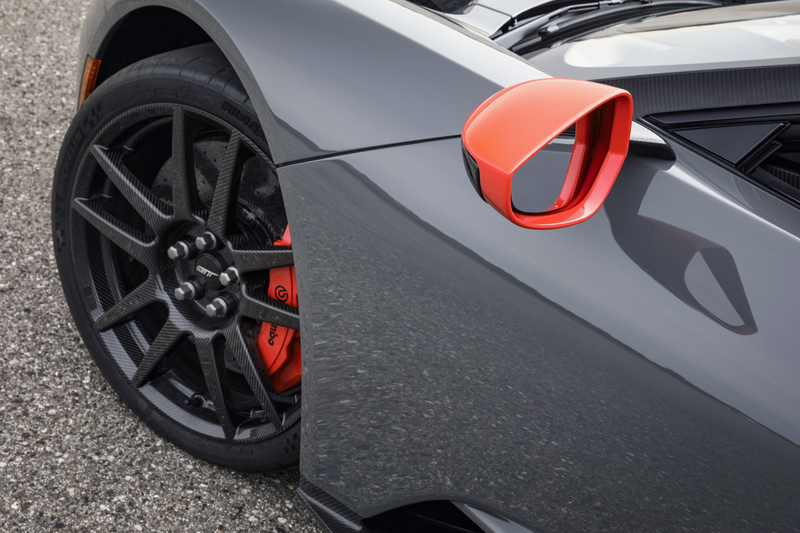 Keeping those items adds back 100 pounds over the Competition Series, meaning the Carbon Series saves about 40 pounds over a standard Ford GT. Is 40 pounds worth getting excited about? 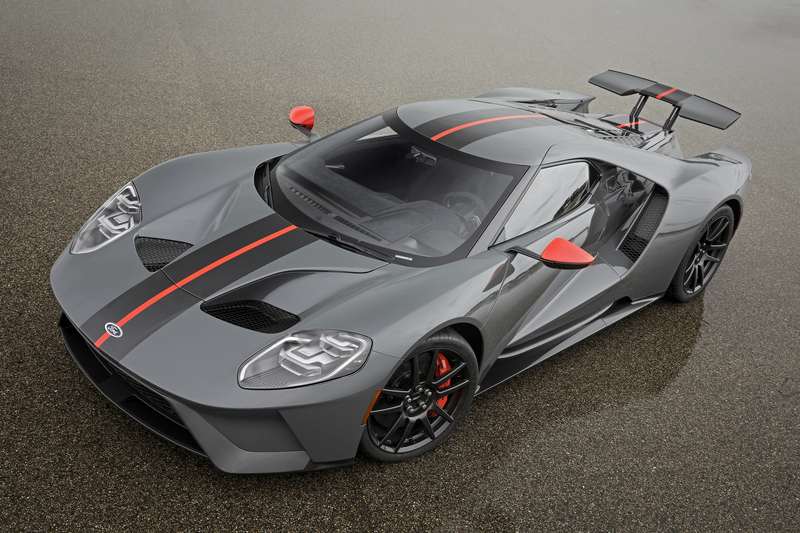 Will it make a substantial difference in how a Ford GT Carbon Series performs compared to a standard Ford GT? Probably not, but there is one one other key option that won me over to the Carbon Series. It’s called the exterior accent package, and it adds color-matched brake calipers, mirror caps and a center stripe between the exposed carbon fiber stripes. The available accent colors are silver, blue, orange and red. When I heard the description I didn’t think the contrasting center stripe would make a big difference in the car’s appearance. Then I saw a picture of a Ford GT Carbon Series with the matched brake calipers, mirror caps and center stripe, and I couldn’t believe how much it impacted the car’s overall appearance. It’s really striking, giving the Carbon Series a totally unique look compared to any other new Ford GT. Next Post:What Superhero Should Drive a Ford GT? Captain America! nice Karl. I’m ordering one this next week. Just got the color sample late yesterday. btw another feature unique to the2019 Lightweight, which is now being called the Carbon edition, is that the alcantra setting material is smooth, where as it is ribbed in all other NFGT’s. Regardless of weight advantage, it’s going to be beautiful car. Congrats!